Today the Department of Justice announced an indictment against two Iranian men: Faramarz Shahi Savandi and Mohammad Mehdi Shah Mansouri for their roles in stealing more than $6 Million in Ransom payments from a 34 month long ransomware campaign known as SamSam. Piecing together the case involved gaining cooperation from two European VPN services, and apparently at least one search engine. The indictment refers, for example, to the defendants using Bitcoin to pay for access to a European VPS, and then searching on May 15, 2016, for "kansasheart.com". The same day, they accessed the public website of Kansas Heart Hospital, and on May 18th, encrypted many key computers on the network and sent their ransom note. 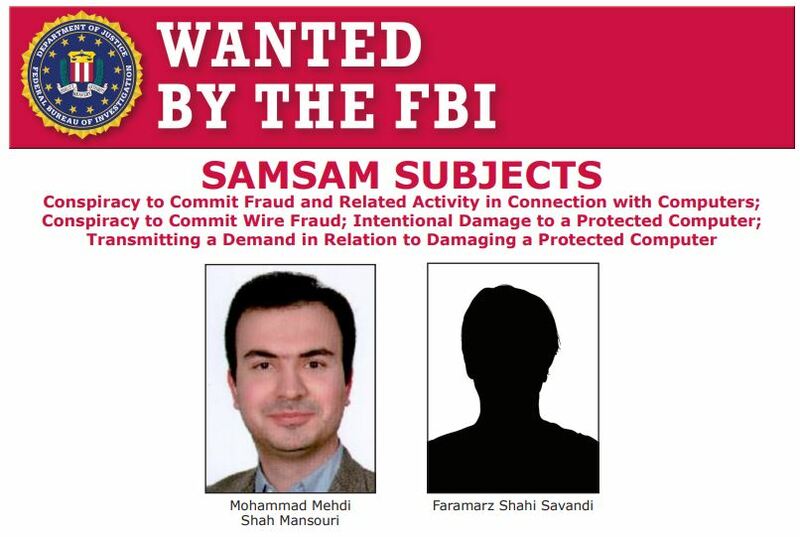 Another key part of the investigation was gaining the cooperation of a Bitcoin Exchanger, which was able to demonstrate that on July 21, 2016, the defendants cashed out at least some of their ransomed Bitcoin into Iranian Rials and deposited it into bank accounts controlled by MANSOURI and SAVANDI. December 14, 2015 - Defendants chatting about the development and functionality of SamSam. January 18, 2018 - Attack on Allscripts Healthcare Solutions, Inc.